He also targeted Fed chairman Jerome Powell, telling the Wall Street Journal he seemed “happy” to be raising interest rates. Asked in the Wall Street Journal interview what he saw as the biggest risks to the US economy, Mr Trump said: “To me the Fed is the biggest risk, because I think interest rates are being raised too quickly”. He said Fed chairman Jerome Powell “almost looks like he’s happy” to be raising interest rates. Mr Trump also said it was “too early to say” whether he regretted nominating Mr Powell but “maybe”. 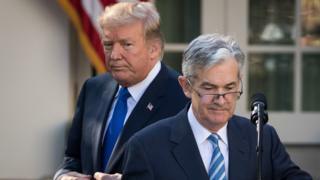 Mr Powell and other economists say the US economy is strong enough that such stimulus is no longer necessary – a shift the Fed marked in September by ending its description of its policy as “accommodative”. Mr Trump also recently said the Fed had “gone crazy” and was “out of control”. Critics worry that Mr Trump’s continued attacks will undermine investor confidence in the Fed’s commitment to manage inflation. Recent presidents have avoided commenting on Fed policy, in a sign of respect for the bank’s independence.